“Believe it or not, it was my first time to ride an airplane!” This was how poet Ericson Acosta greeted his supporters, friends, and family who welcomed his arrival at the Terminal III of the NAIA. Acosta, 40, whose siblings now all live with their own families abroad, is a cultural worker and activist arrested by the military in San Jorge, Samar while doing volunteer research work for a local peasant group. Acosta has been detained at the Calbayog Sub-Provincial Jail for 23 months on trumped-up charges of illegal possession of explosives. Yesterday, Acosta’s supporters were pleasantly surprised to confirm that the Gandara RTC in Samar granted him temporary release for a medical check-up. Acosta’s lawyers filed a motion for medical check-up in July 2012 after Acosta displayed symptoms of serious renal problems. Attorney Persida Rueda-Acosta, Chief the Public Attorney’s Office (PAO) flew to the Calbayog Sub-Provincial Jail with a medico-legal consultant and a paralegal team from human rights organization, KARAPATAN upon the request of Acosta’s family and the Free Ericson Acosta Campaign (FEAC). It was found that Acosta has been suffering from nephritis, a condition characterized by blood in the urine (hematuria), lower back pains, high fever and painful urination (dysuria). These findings prompted the RTC to immediately grant Acosta’s motion for check-up, and allowing Atty. Rueda-Acosta to accompany him right away to the National Kidney Transplant Institute (NKTI) this morning. “Matagal na naming hinihintay ang mapatingnan si Eric. I am coming to see him without my husband who also has an appointment with the doctor for his spinal ailment that has debilitated him for weeks. Gusto nga sana niyang sumama kay Attorney Persida pero hindi na niya kinaya ang sakit,” said Ericson’s 80-year old mother, Liwayway. Dr. Erwin Erfe, medico-legal consultant of PAO said that Acosta’s ailment necessitates “thorough diagnostic examinations, possibly including renal biopsy and other specialized ancillary procedures in a specialist kidney hospital.” These facilities are not available at the Calbayog Sub-Provincial jail, and even in Samar provincial hospitals. Acosta’s temporary release comes in the light of the recent spate of politically motivated arrests of activist organizers all over the country. KARAPATAN reported the arrest of 28 individuals from December 2012 to the few days of the new year. Among them are Randy Vegas and Raul Camposano, government employees and union leaders of COURAGE, Zara Alvarez of KARAPATAN and 19 farmers from Negros. Despite these attacks on human rights and civil liberties, FEAC remains fervent in its bid for the general and unconditional release of all political prisoners. Thus describes former UP Collegian editor Ericson Acosta’s nearly two years of detention in the Calbayog sub-provincial jail in Samar. The worldwide observance of International Day for Imprisoned Writers initiated in Manila by the Philippine Center of the International PEN (Poets, Playwrights, Essayists, Novelists) highlighted the cases of Acosta along with those of Regina Martínez, a Mexican journalist (murdered); Shiva Nazar Ahari, journalist, human-rights activist and blogger (Iran); Muharrem Erbey, a human-rights lawyer and writer from Turkey; Eskinder Nega, a journalist and blogger (Ethiopia). Acosta was arrested without warrant on Feb. 13, 2011, by members of the Armed Forces of the Philippines’ 34th IB led by 2nd Lt. Jacob Madarang. He said he was doing research on the human rights situation in Samar. He was held for three days without charges and subjected to “tactical interrogation” by the military. Three days after arrest in which no charges were filed, he was finally charged with illegal possession of explosives. Visited in his Calbayog detention jail, Acosta describes his life in jail since February 2011. He says his day starts with lining up for the day’s ration of uncooked rice and ends with trying to finish—usually with agonizing difficulty—a blog entry, a statement or a poem. The toughest part of being in prison, he says, is being deprived of liberty and being away from family and the peasant communities he has long considered family. He spent his 39th and 40th birthdays in jail and is about to spend his second Christmas in jail this year. Acosta says he takes on the simple joy of seeing his parents and his only son, Emmanuel, and sharing modest food with other prisoners. He spent his 40th birthday last May sharing pancit with activists. He says his 20 months in an isolated jail in Calbayog, Samar, has been a test of resilience. Acosta is one of the subjects of the documentary “Chained Metaphors,” about imprisoned artists. He was also named finalist for the Imprisoned Artist Prize at the Freedom to Create Awards Festival in Cape Town, South Africa, along with two other artists from Tibet and Myanmar. The finalists were chosen out of over 2,000 nominees from 145 countries by a select jury that included actress and filmmaker Daryl Hannah, novelist Salman Rushdie and ballet icon Mikhail Baryshnikov. The case of Acosta was taken up in the Philippine writers’ forum in a panel of distinguished writers from the Philippine PEN Writers in Prison Committee, such as Bienvenido Lumbera, National Artist for Literature and chair of the Philippine Center of the International PEN; and PEN board members, critic and columnist Elmer Ordoñez and fictionist Jun Cruz Reyes. The cultural sector, led by Lumbera, actors Pen Medina and Nanding Josef, filmmaker Carlitos Siguion Reyna and UP dean of Mass Communications Rolando Tolentino, has rallied behind Acosta and signed a petition for his release. SELDA joined the family of Ericson Acosta to call for the release of Acosta and to commemorate November 15 as the Day of the Imprisoned Writer. Declared as such by PEN International, it is an annual event to “intended to recognize and support writers who resist repression of the basic human right to freedom of expression and who stand up to attacks made against their right to impart information.” PEN International is an organization of writers, poets, playwrights, journalists, etc. who promote literature and defends freedom of expression. Ericson Acosta is among this year’s highlighted imprisoned artist, together with four other writers from Iran, Mexico, Turkey and Ethiopia. Acosta, a writer-artist activist was arrested by elements of 34th Infantry Battalion of the Philippine Army on February 2011 in San Jorge, Samar. He was suspected to be a member of the New People’s Army (NPA) by mere possession of a laptop. Acosta is currently detained at Calbayog Sub-Provincial Jail. For almost two years, Acosta never had trial for the charges against him. 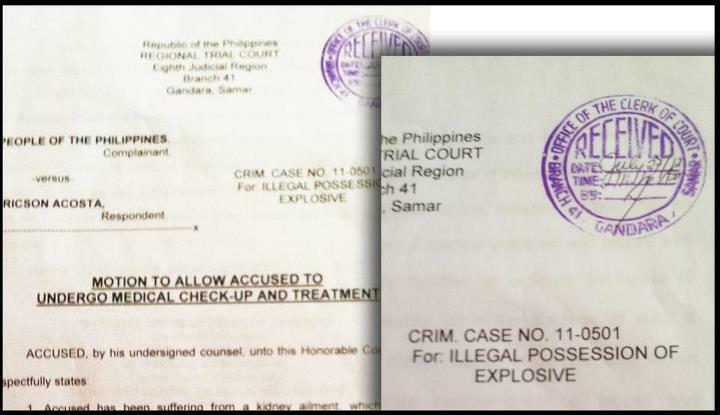 His petition for a review for the charge of illegal possession of explosives at the Department of Justice is still pending after more than a year now. Also, Acosta’s request for the court to have a medical check-up remains unheeded. According to Selda not only do they file trumped up charges against activists or writers, the rotten justice system has made it even harder for political prisoners to get a fair and quick trial. “Mahigit anim na buwan na yang rekwest na ipagamot ang anak namin, bakit ang tagal-tagal sagutin? Ang gusto namin, palayain na nila si Ericson, kasi hindi totoo ang mga ibinibintang ng mga sundalo sa kanya, (“The request for our son to be given a medical check-up has been filed for more than six months now, why are the courts taking so long to answer this? What we want is for Ericson to be released, because what the soldiers accuse him is not true.”)” Isaias Acosta, father of Ericson said. The number of political prisoners is increasing under this administration. Recent arrests are that of Rolly Panesa, a security guard arrested and tortured on October 5. Government soldiers insist that he is Benjamin Mendoza, an alleged high ranking NPA rebel; Zarah Alvarez, a human rights worker of Karapatan-Negros was also arrested on October 30. She was charged with murder. While Grayson Naogsan, the son of Cordillera People’s Democratic Front spokesperson Simon Naogsan was taken from a mall in Baguio on November 5. He was disappeared for several days before his family and human rights workers found him at the Ifugao provincial jail. He was arrested based on a defective warrant baring a different name. “Impunity has not been addressed with the increasing number of political prisoners today. 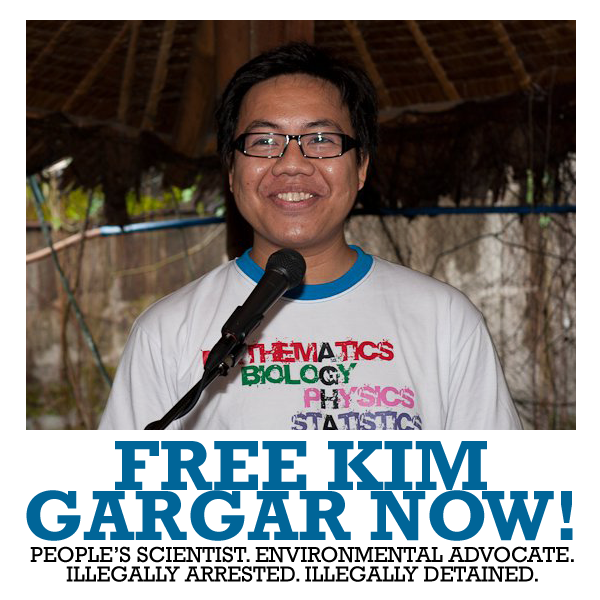 Ericson Acosta is one of the 401 political prisoners in the country,” Angie Ipong, secretary general of SELDA said. “We fear that the numbers will escalate with the Noynoy Aquino government’s continuing tactic of illegal arrest and detention to silence its perceived enemies,” Ipong continued. CAMP OUT. Troops from the 8th Infantry Battalion are deployed within a civilian facility — the Calbayog sub-provincial jail where political prisoner Ericson Acosta is detained for more than a year now. The family of political prisoner Ericson Acosta decried threats against their son and their family after receiving text messages which said he or his parents might get killed on November 2, All Souls Day. Ericson Acosta, 40, is a poet and journalist who was arrested without warrant on February 13, 2011 in San Jorge, Samar. Military elements accosted him for mere possession of a laptop. After three days of interrogation and torture inside a military camp, Acosta was charged with illegal possession of explosive and was tagged by the military as a high-ranking NPA rebel. “Bakit naghahamon ng tulong ang Presidente para maresolba ang mga kaso ng pang-aabuso, gayong nasa kanya na nga ang lahat ng kapangyarihan? (Why must the President challenge people to help him solve these cases of abuses, when he has all the power to do this? )” he asked. “Gusto ko pong tanungin ang Pangulo: sino po ang magiging responsable kapag may masamang nangyari sa anak ko habang siya’y nakakulong at hindi gumugulong ang hustisya? ( I would like to ask the President: who will be held responsible if something bad happens to my son while he is unjustly detained? )”said Mr. Acosta.